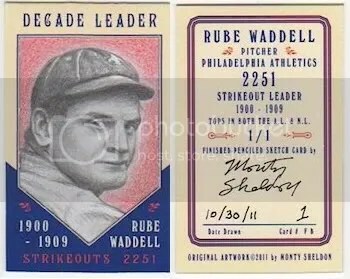 Sports artist Monty Sheldon released a few images of his 2011 mini sketch card series. Each framed mini sketch is serial numbered 1/1 and measures 1 1/2″ x 2 7/16″. Each time Sheldon reaches a “like” milestone on his Facebook Fan Page (#100, 200, 300, etc) he will have a giveaway where you can win some of his work from this series. Monty Sheldon was one of the earliest employees at Dark Horse comics before leaving to start working on his popular Artballs. Since then he has expanded into cigar boxes, hockey pucks, and his own sketch card series. 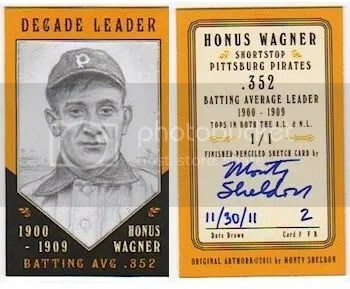 You can also see a lot of his work in various Topps products such as Allen & Ginter, Chicle, and Gypsy Queen. Sheldon did an interview with Sports Card Info two years ago, and I have been following his work ever since.